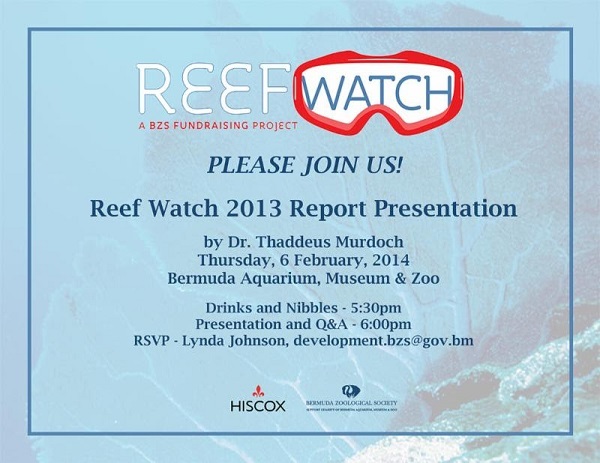 The Bermuda Zoological Society is getting set to host a Reef Watch 2013 report presentation by Dr. Thaddeus Murdoch on Thursday, February 6 at the Bermuda Aquarium, Museum & Zoo. “Drinks and nibbles” will be available at 5.30pm, with the presentation itself, followed by a Q&A session, kicking off at 6.00pm. For more information about the event, or to RSVP, please contact Lynda Johnson via email at development.bzs@gov.bm.